2002 brought a lot of changes for BBM. They issued their first "Historic Edition" set that was labelled as such - the "All Time Heroes" set. 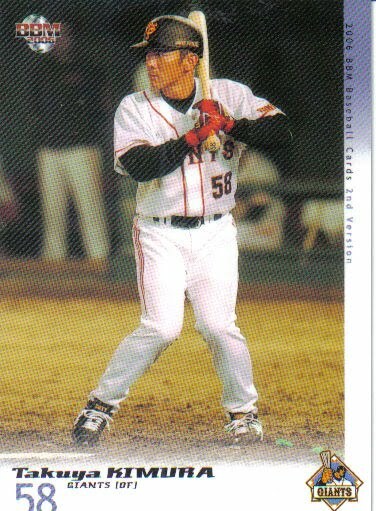 It had 240 cards - 20 per team - which broke down to the current lineup for each team, the "greatest" OB lineup for each team, and a "Memorial Hero" and checklist card for each team. The set also included insert cards for current players ("Big Heroes") and OB players ("Great Heroes") as well as autographs of OB players and a Hiromitsu Ochiai bat card. BBM got the rights to produce a Japan National Team set for the first time - it was a 47 card box set (with possible Yoshinobu Takahashi jersey cards) for the 2001 World Cup team. The Preview set contained 123 cards with a design that was completely different from the regular sets. It had two insert sets - a 4 card "Titleholders" set featuring the 2001 MVP and Rookie Of The Year award winners and a 24 card "Team Leader" set featuring the batting and ERA leaders for each team. 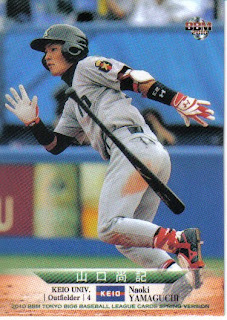 The big change for the year was that BBM split the regular set in two. The first set (1st Version) was 439 cards and contained the subsets (Leaders, Record breakers) that were typical for the previous regular sets. 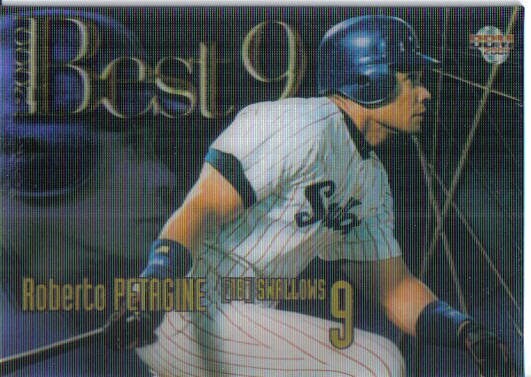 It also included the "Best 9" and "Prime Time Players" insert sets. The second set (2nd Version) was 428 cards and included the "Golden Glove" and "Opening Game" insert sets. There were also silver and gold signature parallel cards for each set and various jersey cards. I want to stress that unlike 1992 when BBM issued the regular set in two series - the 1st Version and 2nd Version sets are really two distinct sets, although they are numbered consecutively. Each set features 30 players for each team (plus team checklists and manager cards) and there is a substantial overlap of the players in each set. Plus the two sets feature a different design for their "regular" card. 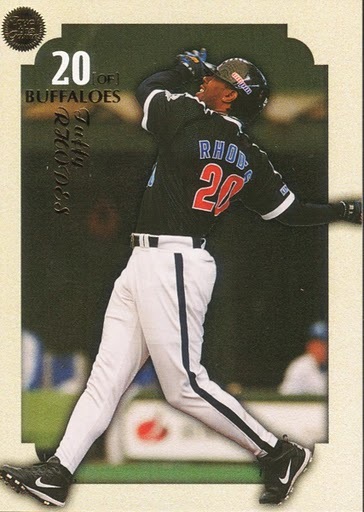 BBM also increased the number of teams that it issued pack based team sets for - in addition to the Giants and Tigers, the Hawks and Buffaloes also had sets. All four sets featured various insert and memorabilia cards - autographs, jersey cards, bat cards and batting glove cards. 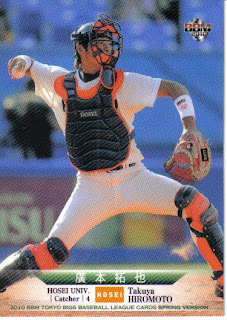 An additional Tigers team set ("Extra Version") was produced that was roughly identical to the first but with a metallic sheen. The 67 card boxed All Star set also featured possible bat and signature cards. BBM replaced the "Diamond Heroes" set with "Touch The Game" - a 213 card set featuring several insert sets and a couple memorabilia inserts - game used balls, bats and windbreakers. Box sets were issued for both pennant winning teams - the Giants and Lions - featuring (you may be detecting a theme here) possible game used bat or jersey cards. The Nippon Series box set (surprisingly) does not feature any memorabilia cards. The final set of the year is a 55 card "Legend Of Hideki Matsui" boxed set in honor of Matsui's departure from NPB. The set featured the possibility of an autographed or game used memorabilia card. 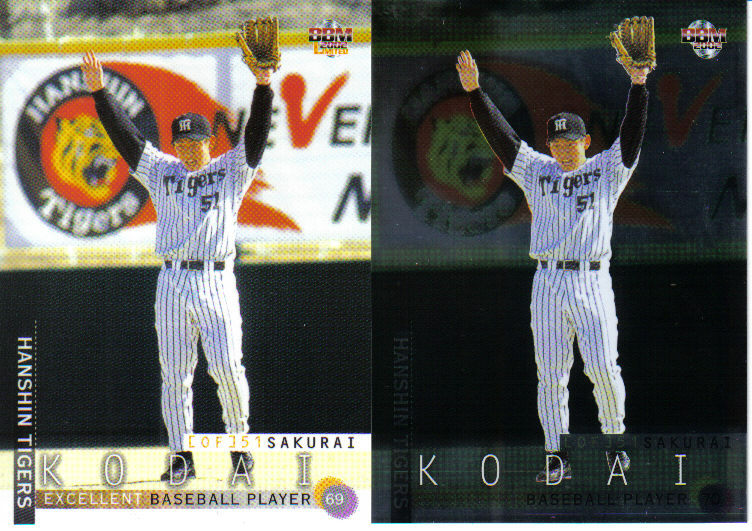 From top to bottom, that's the 1st and 2nd Version boxes, Koji Akiyama's cards from the Preview (#P77), 1st Version (#229) and 2nd Version (#675) sets, Kodai Sakurai's cards from the Tigers team set (#T68) and Tigers "Extra Version" set (#EX69) and Tuffy Rhodes card from the "Touch The Game" set (#104). OK, if I try to do several years at once, I'll never get the posts done. Let's try a doing this a year at a time. 2001 - BBM Preview set is 124 cards including Draft Picks again. In contrast to the two previous sets, the cards feature roughly the same design the the regular set will, but with different pictures. 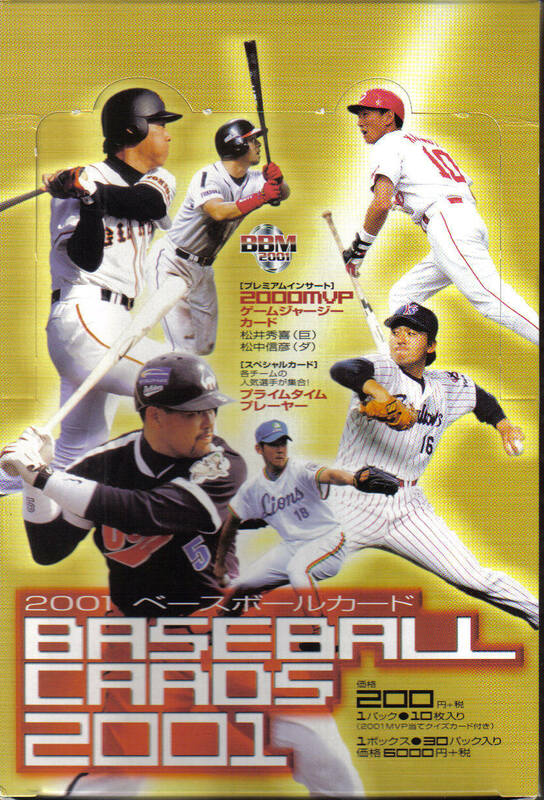 It has two insert sets - one featuring the two MVP winners from 2000 (Hideki Matsui and Nobuhiko Matsunaka) and the other being the Best 9 of the 20th Century. The regular set is 639 cards, including "Late Series" cards for the Blue Wave and Tigers. The insert sets are Best 9, Golden Glove and Prime Time Players. There are two facsimile autograph parallel sets - gold and black. There are also jersey cards for the two MVP winners. 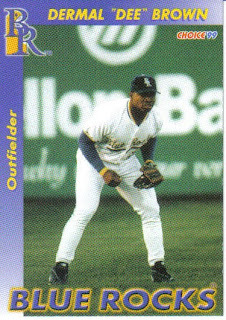 For the first (and last) time, the insert and jersey cards are updated as part of the "Late Series", so there are two versions of each insert and memorabilia card. 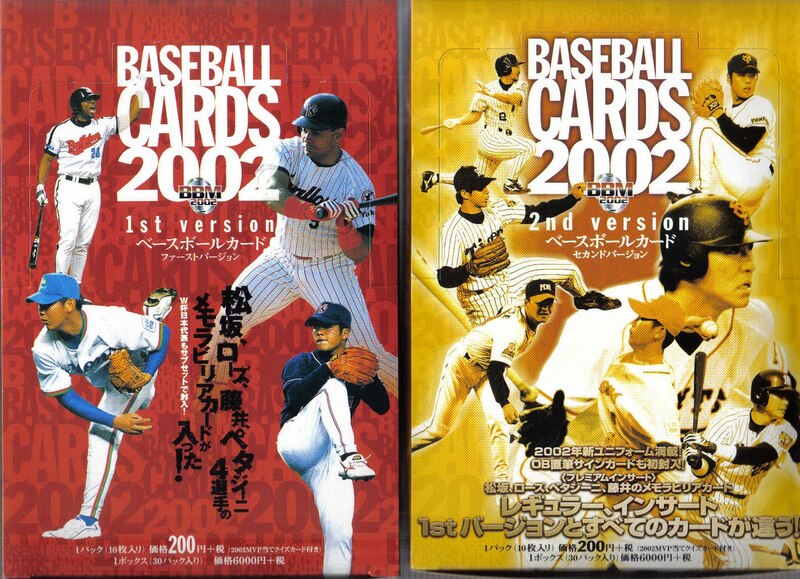 The Yoshitomo Tani Variations - from left to right, Tani's cards from the Preview set (#P94), the regular set (#462) and the "Late Series" (#630). The Diamond Heroes set grows to 276 cards with insert sets of "OB Heroes" and "Ace & Slugger", along with windbreaker and bat memorabilia cards. 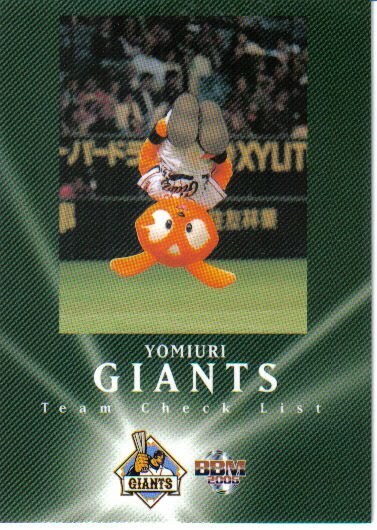 Pack based team sets are again issued for the Giants and Tigers with various insert and memorabilia cards (Keiichi Yabu glove and Tomohiro Niola windbreaker) along with autographs of Giants players and Masayuki Kakefu for the Tigers. BBM again issues a Giants set as a promotion for the Yomiuri Shimbun, although the set is only four cards. 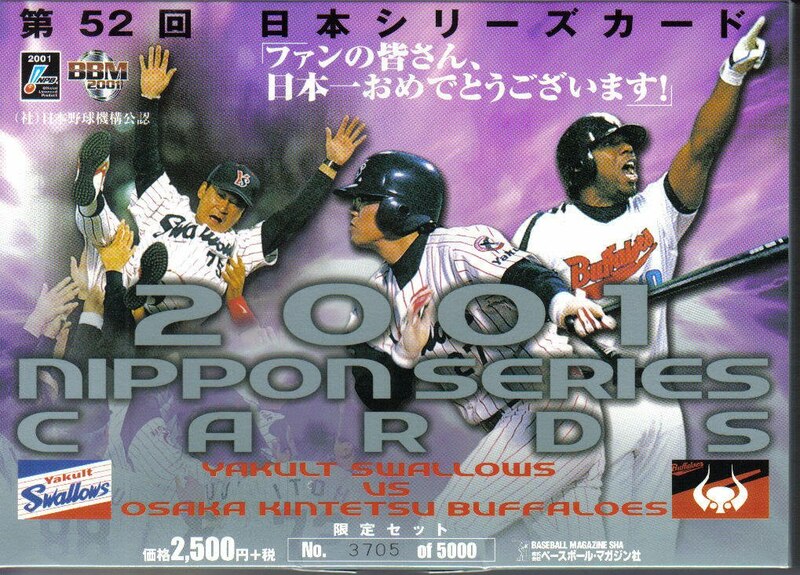 Boxed team sets are issued for the two pennant winners - the Swallows and the Buffaloes. Both sets contain random memorabilia cards - Tuffy Rhodes bat, Norihiro Nakamura glove and Atsunori Inaba jersey cards. 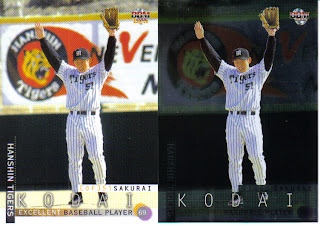 For the first time, the All Star and Nippon Series set have card designs that do not resemble the regular set's. 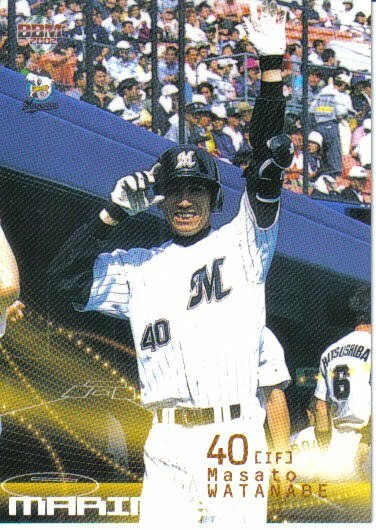 A 40 card boxed set is issued to celebrate the retirement of Giants manager Shigeo Nagashima - it contains possible memorabilia cards (jersey, patch or windbreaker) and some sort of "monochrome etched" card. At the top of the post is a 2001 BBM box. 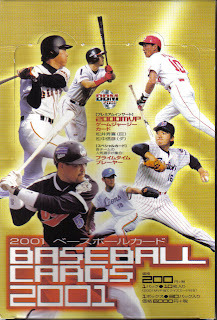 At the bottom is a 2001 Nippon Series set box. 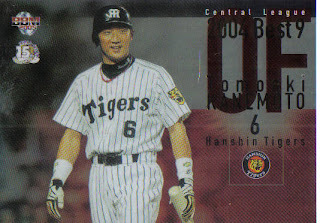 The 2010 BBM Tigers team set was announced on BBM's website yesterday. It's a pack based set that will be a little larger than the other team sets announced so far this year - 117 cards rather than 99 cards. There will be 80 cards of players, coaches and the manager, one checklist, three cards of rookies, four cards of veterans, a four card subset that is being translated as either "Opening a new front-line forces" (Google) or "New war potential of commencement one troop" (Babel Fish), seven cards showing Tiger coaches when they were active players, nine puzzle cards, three cards of the "cleanup trio" and the six card BBM 20th Anniversary "Cross Stream" cross-set subset. 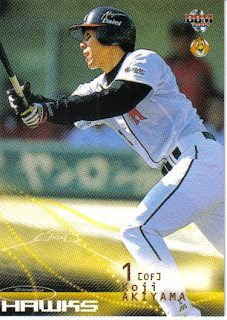 There are two nine card insert sets - "Rock On Victory" and "Smile Shot" as well as autograph and memorabilia inserts - I think there are jersey cards of Kenji Johjima and Kentaro Sekimoto. The set will be out in early June. 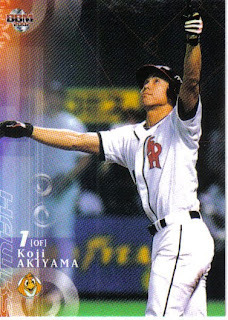 I found a new website that sells Japanese baseball cards that will ship to the US - AmiAmi. They sell unopened boxes of BBM (both boxes of packs and boxed sets) and Owner's League cards as well as the All Japan Baseball Foundation set (which is sold out). 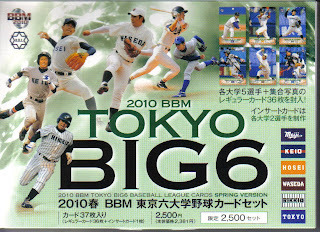 I bought the new BBM Tokyo Big 6 set through them. It ran me (with shipping) about $29. I'm not quite sure how it broke down in dollars, but the set was 1995 JPY and the EMS shipping was 675 JPY for a total of 2670 JPY (shipping is half off in April) - which I think is only 170 yen more than what Deanna paid for it at Jingu. What really amazed me was how fast I got the set. I paid for the set last Friday! The post office tried to deliver it yesterday (Monday) but no one was home, so I couldn't get it until today. I don't think I've ever gotten anything from Japan that fast. (Heck, I don't think I've gotten much from eBay that fast.) Obviously your mileage may vary - I may have just gotten lucky. But I'd say AmiAmi is a welcome addition to the list of places that sell Japanese baseball cards (and I've added it to my list of links on the side of the blog). 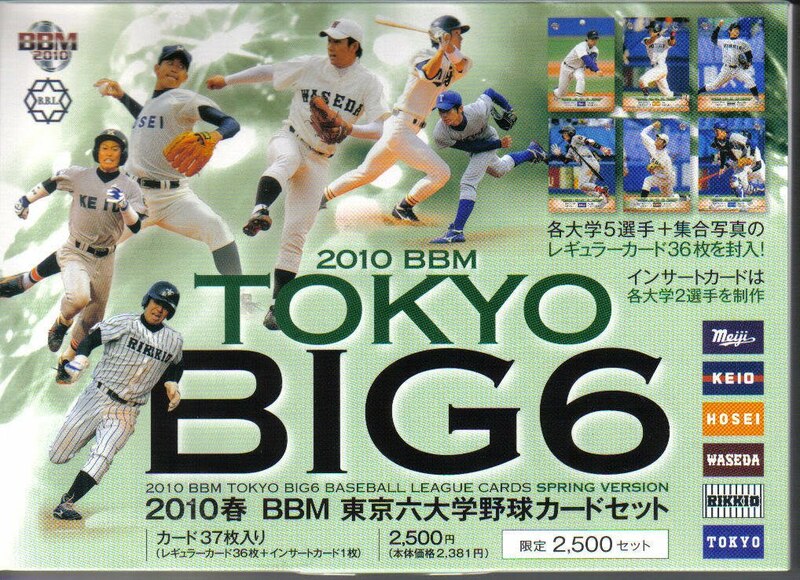 OK, Deanna totally scooped me on this so I won't have much to add from what she's already said about it, but I got my copy of the new BBM Tokyo Big 6 Spring Version set in the mail today. It's a box set containing 37 cards (36 regular cards plus an insert card). 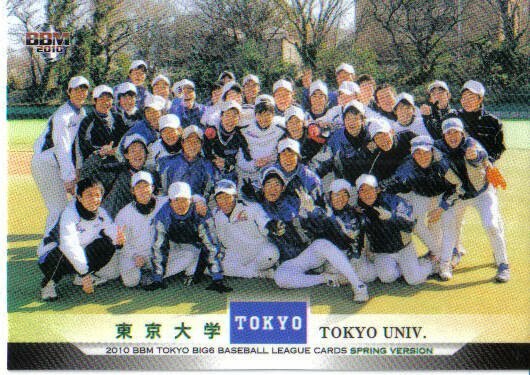 The 36 cards break down to a team card and five player cards for each of the six university teams in the Tokyo Big 6 collegiate league. 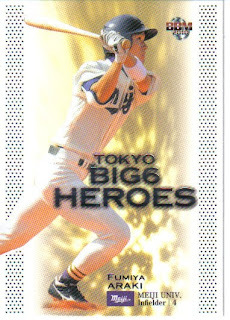 The insert card is one of 12 "Tokyo Big 6 Heroes" - two for each team. As Deanna mentions in her post, BBM's previous two editions of this set featured 60 cards - 9 players plus a team card per team and no insert cards. Personally, I preferred that - especially since the price of the set stayed roughly the same even though there's 23 fewer cards. Deanna's got the full checklist for the set up in her post, so I'll just show some cards. As always, BBM has some great pictures. That's Takuya Hiromoto (#15), Naoki Yamaguchi (#10), Masatoshi Itoh (#27), the Tokyo team card (#36) and the "Tokyo Big 6 Heroes" card in my set - Fumiya Araki (#SP02). There's a new Prestige Collectibles Auction (well, mini-auction) running until April 22. 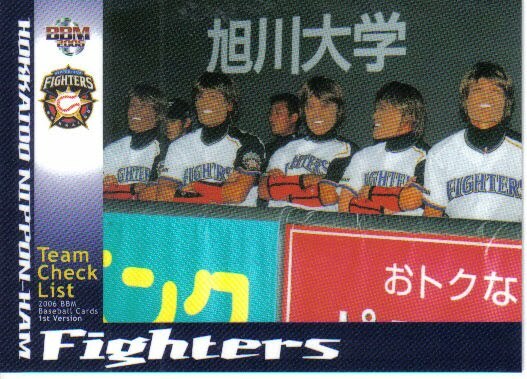 As expected, yesterday, BBM added information to their website regarding the Fighters team set for 2010. 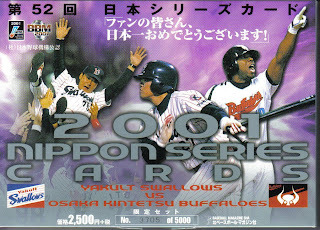 Like the other team sets already announced for this year, this set is a 99 card pack based set featuring 69 player/manager/coach cards, 1 checklist card, 8 "Title Holder" cards, 3 "Brightest Hope" cards, 9 puzzle cards, 2 "Topics" cards and 6 cards for the BBM 20th Anniversary "Cross Stream" cross-set subset. There will also be two insert sets - a 9 card "Key Players" set and a 6 card set for Yu Darvish that I think are "SportsFlics" type cards. 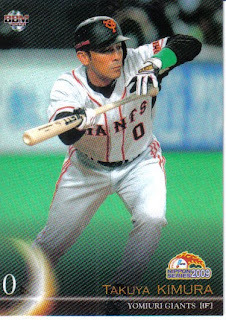 There are also possible autograph cards - looks like all 69 of the player/manager/coach cards have an autograph version. The set will be out in mid-May. 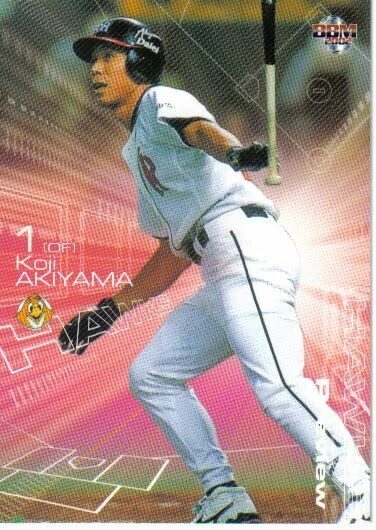 Friday, BBM added information to their website for two more pack based team sets for 2010 - the BayStars and Carp. The BayStars set will contain 99 cards - 74 player/manager/coach cards, 1 checklist card, 6 "2010 Newcomer" cards, 9 "puzzle" cards (probably 3 3 card puzzles), 3 "young gun cards" and 6 cards for the BBM 20th Anniversary "Cross Stream" cross-set subset. The set also has a 9 card insert set called "Heart Of The Order" and some jersey and autograph cards. It will be in the stores in mid-May. 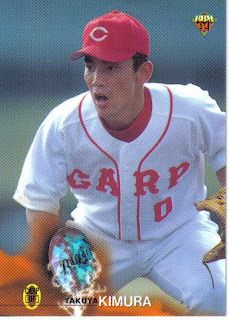 The Carp set will also contain 99 cards and will be broken down in a very similar manner. There will be 78 cards for the players, manager and coaches, 1 checklist card, 2 "Topics" cards, 9 "puzzle" cards, 3 "starters" cards and the 6 "Cross Stream" cards. There will be two insert sets - a 9 card set for "active players" and a 6 card "Uniform Number Story" set, plus possible autograph cards. It will go live in late May. I also expect to see a Fighters set on BBM's website any day now as there's already information about it a Target's Japan website and at AmiAmi. Very sad news out of Hiroshima - Giants coach Takuya Kimura has passed away from a brain hemorrhage a few days after collapsing on the field at Mazda Stadium. He was 37 years old (he would have turned 38 next week). Kimura originally came up with the Fighters in 1992, moved to the Carp for the 1995 season, then was traded to the Giants in 2006. 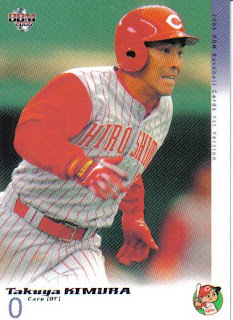 He had retired following last year after being on his first ever Nippon Series Champions and was in his first season as infield and running coach for Yomiuri. Deanna had some comments about him here. Once again, Mr. Giabitt fills in for the Easter Bunny. 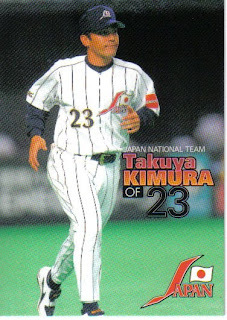 Insert cards include a World Baseball Classic set (12 cards - 10 of Derek Jeter and 1 each of Darvish and Aroldis Chapman) and a Sadaharu Oh home run set (868 cards all showing the same picture of Oh, but with different numbers). 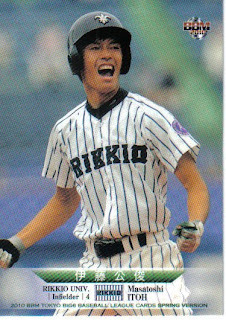 Memorabilia cards will include pieces of Tsuyoshi Shinjyo's Darth Vader mask and pieces of the Colonel Sander's statue.